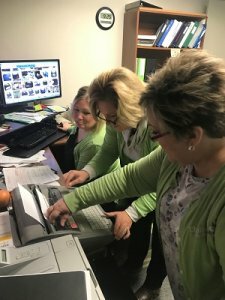 How many green shirts does it take to work a typewriter? Apparently, fewer than it took to move Tony’s desk. Our technology has certainly changed over the years. Gone are the days of the typewriter, digital planimeter, survey rod and chains, drafting table, slide rule, and abacus (that one applies only to Jeff Puthoff and Tony). Now we use sophisticated traffic simulation software to design efficient intersections. We develop fancy site design renderings in Photoshop. And we use complicated, precise MS Excel spreadsheets to determine the perfect amount of pizza we need to feed everyone in the company. Whether the task at hand requires old-school technology or not, it often takes a little teamwork to get the job done (like [l-r] Brittany, Caray, and Holly above). And thanks to this teamwork, we can produce a perfectly typed tax form, a safer intersection, a full-color, public meeting-ready image, and enough Lotsa Meat pizza to feed the whole COEC crew.